Today I have a little altered Twiddleybitz and Prima project to share with you all. This one will be display at the TWIDDLEYBITZ Booth #60, Brisbane Expo this coming Queen's Birthday weekend. 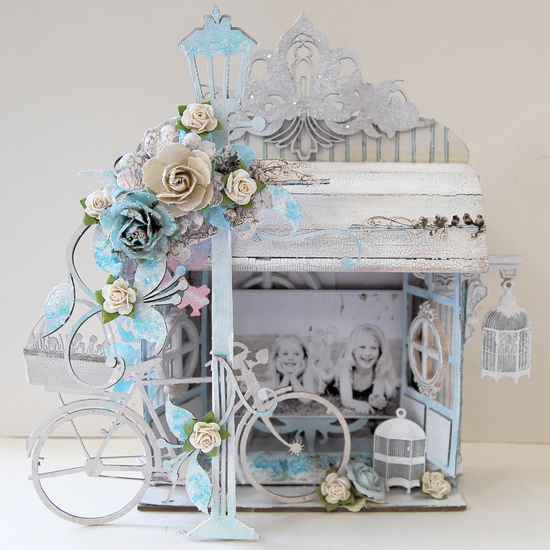 It has also been featured recently for Prima's Designer Day Blog Feature. 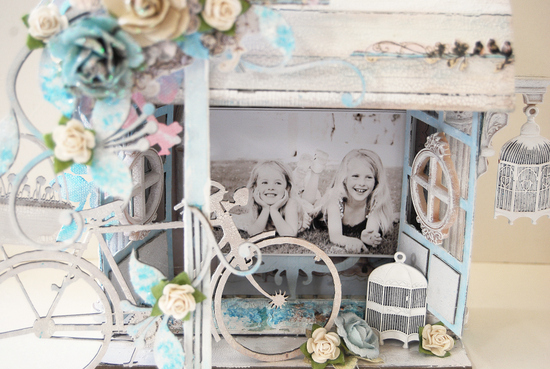 I have combined some wonderful Twiddleybitz components with some gorgeous Prima to come up with this sweet decor way of displaying a photo of my two precious girls. I first constructed the Twiddleybitz 6" x 6" Shadow Box and added the Awning from the Fence and Awning Kit across the top. Note: I have not used the fence in this instance and have popped aside to use for another project. The sides of the box were covered with Prima Nature's Garden patterned paper. Pixie Glen patterned papers were used for decorating the inside and across the top. The 6" x 6" Paper Pad was perfect for this. A 'faux' brick effect was added with the help of a Prima Brick acrylic mask, some Texture Paste, Diamond Dust, Tim Holtz Distress Ink and Stain and Tattered Angles Glimmer mists. 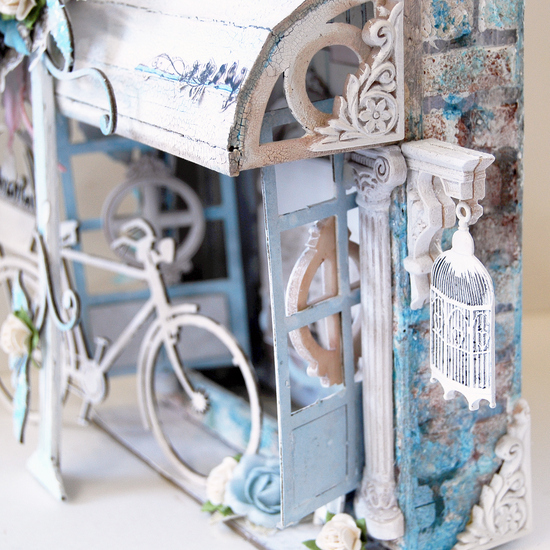 The awning has had a touch of shabbiness added with Tim Holtz Distress Paint and again some more inking and staining. 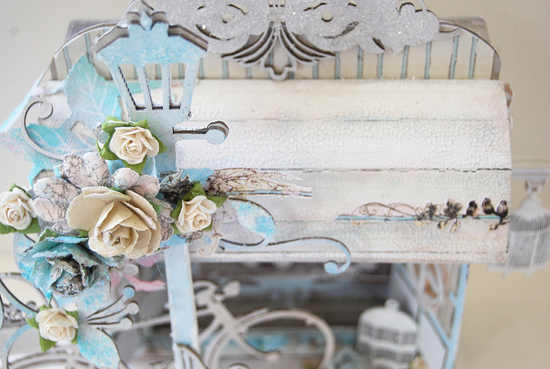 A touch of decorative architecture has been added with an assortment of Prima shabby Metal Treasures and Resin. These have been designed by Ingvild Bolme and they are amazing. You can check out more about Ingvild here as she has been featured recently on the Prima blog for a Designer Day Feature. Roman Pillars and Gable elements were added to the front and sides of the box and awning. An Old Church Window sits on the inside back wall and smaller mini round windows sit on the inside of the opening shutters which were created from the Twiddleybitz Mosaic Grab Bag. Some Metal bird cages were also added - one to hang from a gable element - I stuck two of these elements element to create more of a 3D look and to support the top of the cage. A Twiddleybitz Lamp Post and Bike with Flower Basket was added to the front - the lamp post was removed first and attached to sit behind the bike. A Circle Flourish adds a decorative accent to the top and a Flower Flourish Vine was cut up and attached along with Prima Flowers and Alla Prima Resistant Canvas. Also make sure you check out the Twiddleybitz NING site for more inspiration and show updates. The Twiddley gals have been madly creating and have lots of awesome projects that they are now starting to reveal in the gallery. This looks amazing.. beautiful details..I shall look for it at the show!! Stunning Trudi, I will be at the show at booth no 72 with Scrappy-go-Lucky so I will definetley be having a look at this.